I am surprised this never made it over here from my Confessions of a Pop Fan blog, where I reviewed the film during its revival run. I think maybe when the Criterion was announced I intended to do a separate piece. 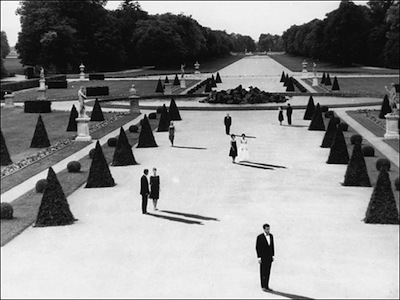 I'd still like to one day, as I think one's impression of Resnais' masterpiece changes viewing to viewing, but in the meantime, here are my thoughts from April, 2008. 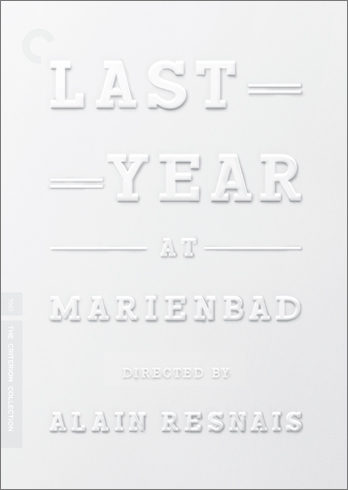 Last Year at Marienbad is a rumination on an affair. Twelve months before, X (Giorgio Albertazzi) met A (Delphine Seyrig) and the two had an affair--or so he says and so she denies. The "plot" of the film is X trying to get her to admit to what happened. They had made an agreement to meet after the year was up, so that she could remove herself from her husband, M (Sacha Pitoeff). The film is structured as a string of elliptical, poetic remembrances, the same event revisited in multiple ways, the setting and the circumstance changing. The director, Alain Resnais (Hiroshima, Mon Amour), is attempting to replicate the variables of memory and the flickering flames of passion. A romance may be alive for the man in one way, but alive for the woman in a completely different way, and fear of the future will alter its existence even further. So it goes, over and over, M's insistence, A's denial, an off-hand admittance, a retreat. All the while, M circles the room, looking like a holdover from Dr. Frankenstein's lab, luring other men, including X, into a card game they can never hope to win. The game is another series of patterns, a sequence of cards displayed the same way each time, removed in a different order, but always with the same result. Shot at various locations in Bavaria, the opulent estates and posh interiors used for X and A's wanderings are tremendous. 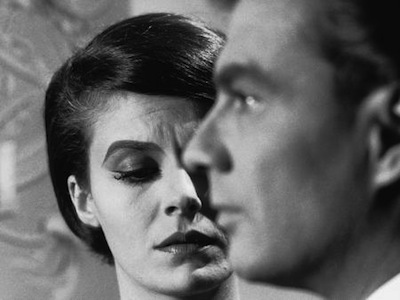 More distracting, however, is Delphine Seyrig. Outfitted in gowns from Chanel, she is one of the most dazzling women to ever appear on a movie screen. In some scenes, she wears a dress made entirely of feathers that is to drool over. With her inky black hair and pale skin, Seyrig is practically otherworldly. Though on the surface she must portray a chilly demeanor, her lies are apparent in her face and tentative movements. There seems little debate that A is the woman X is looking for. If she's not, if he really is mistaken, then she surely wishes he wasn't. If his tale is invented, then the variations are merely bait in a fishing expedition. Concoct enough scenarios, and maybe she'll agree to one of them.